It’s hard to believe, but most people don’t know the #1 secret that separates rich lives from poor lives. Should I buy stocks or bonds? Should I look for a better job? Should I eat healthy or unhealthy? Should I go to bed on time or watch one more episode? Should I exercise or veg-out? The answers to these questions are easy. But having the willpower to act on them isn’t. That’s where you, me and the rest of the human race turn irrational at our own expense. Dan Ariely, professor of Psychology and Behavioral Economics at Duke University and author of Predictably Irrational recently sat down for an interview in the Scientific American. He explained that to counter our irrationality … make more rational decisions … and therefore have a better life … we first need to be aware of how we’re irrational. “For instance,” Ariely said, “since we are all realizing that we’re not saving enough for retirement maybe it is time to take action and force ourselves to behave better. The interview got me thinking about decision making and some of the strategies I’ve used to separate my irrational biases from the objective truth. Today I want to share ten of the best ones I’ve found. Each can help you make better decisions on everything from finances to health to relationships. Trick #1: Pretend You’re Someone Else When You’re Deciding. A Princeton University study found participants were more objective when asked to make a decision that would appear objective to someone else. This requires some mental role play, but it’s worth it. Trick #2: Force Yourself to See the Good in Bad Situations and Vice Versa. One quick way to lower the emotional impact of a situation is to flip the event on its head. When you change how you view an event, it calms your emotions. That, in turn, helps you make clearer decisions. So the next time something bad happens, try asking what good can come out of it. And remember that the same thing applies to “good” events — always try to keep them in perspective, too! Trick #3: Set a 10 Minute Timer and Let Your Brain Return to Baseline. Whenever you’re about to make a big decision, take 10 minutes to relax first. Listen to music … look at pictures of unrelated things on the internet … or do something else that allows your brain to recalibrate. If you have a smartphone or stopwatch, it’s easy to set a timer. And why ten minutes? Well, a study done by the Association of Psychological Science found extreme emotions fade and return to a neutral emotional baseline within approximately that amount of time. Trick #4: Start at the Default Instead of Getting Paralyzed By Your Options. Instead of comparing options endlessly and putting off a final decision, just choose one and stick with it. Essentially, this is what Dan Ariely recommended earlier. One study found that when new employees were automatically enrolled in a company 401(k), their participation was higher and they stuck to the default contributions for longer than employees given the option to opt-in or opt-out. Trick #5: Recognize What Kind of Mood You’re In. This is easier said than done but it’s important because your current mood will influence your decisions. For instance, if you’re upset that your favorite sports team lost the game last night, that pessimism might cloud how you feel about a completely unrelated topic. To quickly figure out what kind of mood you’re in, write down three things you’re feeling at that moment. Then take a step back and make sure you’re in the right frame of mind for the task at hand. Trick #6: Measure Your Decisions on a 0-10 Scale. 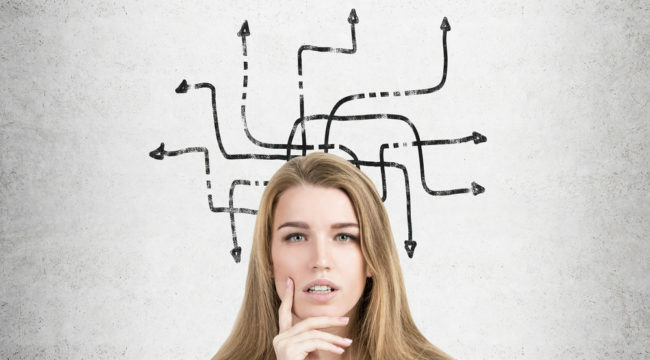 Angelika Dimoka, director of the Center for Neural Decision Making says that identifying your own preferences can be a major problem when you’re faced with complicated decisions. One way to overcome this hurdle is by placing everything on the same scale. For example, let’s say you’re trying to decide between two houses. One house is in a better neighborhood. The other is bigger. One looks nicer. The other has a garage. Put a numerical value between 0-10 on each individual attribute then add everything up. When you do this, you can better measure complicated choices that seemed incomparable before. Trick #7: Ask ‘Why’ Five Times. This method works by forcing you look at facts instead of focusing on your own assumptions. Really, the number five is arbitrary … the larger point is drilling down until you get to the core reason or belief. Trick #8: Use the GOFER Technique. Another simple decision-making strategy that leads to clearer thinking is the GOFER technique. Going through each step helps you understand what is motivating your decision and how you might make better choices. Facts: Find the relevant information. Effects: Imagine the outcomes of your actions. Review: Plan your implementation of the action. Trick #9: Don’t Let “Recency” Control You. Have you ever been so busy you only got around to checking your email at the end of the day? And did you notice a lot of “urgent” matters either resolved themselves or didn’t feel as pressing as they might have earlier? “We pay a lot of attention to the most recent information, discounting what came earlier,” says George Loewenstein, behavioral economist at Carnegie Mellon University. To avoid the recency effect, think about the context in which you’re taking in information. Take control of the context and your point of view will be more objective. Trick #10: Build in High Stakes. As usual, Warren is right. When we place importance on truly important things, we will inevitably grow richer in health, wealth, and overall happiness.